You might be wondering where the time has gone, but we are already over half way into the year. Yes, it’s that time already to really analyze your efforts over the past 6 months and see how you can go forward in the last half of the year. What you should know is that website monetization is changing, and if you are not up to date with all of the latest trends, you will get left behind. In the first quarter of the year we saw the hype of Mobilegeddon become hysteria, whilst in the last few months more online publishers have shown concern about mobile ad blocks. It’s also challenging to strike a balance between monetizing your site and not annoying your readers, and careful thought is needed when planning which direction to take. With all the commotion over the year it’s not surprising that people are looking to make the most of the next 6 months, especially when it comes to monetization. I have put together 5 strategies to help you upgrade and monetize your site using modern methods fit for 2015. When you are already an established online publisher, you can start creating content that people actually pay for. When you have outstanding content that can be published as an exclusive report, you will find that your readers will actually pay for it. For example, a new exciting branch at VentureBeat called Insights is set to transform the site into a place for meaningful insights and research developments in relevant industries. Offer premium content in the form of exclusive eBooks, guides or reports. Make sure if you do take this project on you can actually deliver with something more ‘meaty’ than your usual content. If you are an expert in a particular field, you can add a “hire me” page or plugin. This way people coming to your site can invite you to speak at events or work on a project with them. Some thought leaders are even allowing their readers to have a 5 minute online call with them, which also brings in extra income. Some companies are starting to monetize their site by generating leads for other people. Yes, this might sound strange, but it is similar to affiliate marketing and all you would need is a contact form for your partnering business, and you receive a payment from all sign ups without doing any work. Make sure that you work with businesses in your industry so that it appears natural on your site. The important factor with this method is to make sure you focus on building your audience before attempting to monetize here, and it is more suited to the established publishers that have a targeted and captive reader base. The web is now saturated with free content, the good, the bad and the ugly. Readers can access so much information and generally it’s for free. Though with the rising demand for good content, top online publications are implementing ‘paywalls’ that both push the boundaries of delivering excellent content and also brings in extra needed revenue. The Information publication charges its readers a $400 yearly subscription, and people pay. The Wall Street Journal also applies a charge for their content, at $12 for 12 weeks and by making it affordable it makes people happy to part with their money. The reason why it works is that readers know that when they pay they will receive the freshest content, from the best journalists, and this is the audience you want to attract. There are other alternatives, for example Mark Yackanich, CEO of Genesis Media, has suggested giving first time users of your site access to the content served with ads. If they return a second time, you can serve a 15 second video ad that they have to watch in order to see another 5 articles, and continue reducing the access each time they visit until they reach a limit when they have to subscribe (with a discount of course). The Magazine publication monetized their content by focusing their distribution to be through an iOS app which allowed a 7-day-free trial through the App Store, which would change to $1.99 per month subscription. This is a way to increase your profits as an online publication, as once your readers download an app and are hooked to your content, they are likely to pay for it too. When you have enough resources you can actually start offering your services to brands and other businesses. Take Buzzfeed for example, they have a team of creative experts that are able to develop a content campaign that would then get spread over their networks. Huge brands such as Virgin, Lenovo and Mini have used, and paid, for this service and have had great results. If you are just starting out in this field, try not to make sure you don’t take on too many projects as this will impact your other content. If you didn’t know, a millennial is a person that reaches young adulthood during the 2000’s. These people, probably you reading this article, will never remember a life before internet. This specific group is evolving at a rapid rate, keeping up with all the latest gadgets and wearable technology is a full time business. According to PewSocialTrends Research over 80 million Millennials are in the US; online publications should be aware of who millennials are and how to upgrade their site with them in mind. If you get this right, you will be bringing in revenue for generations to come. 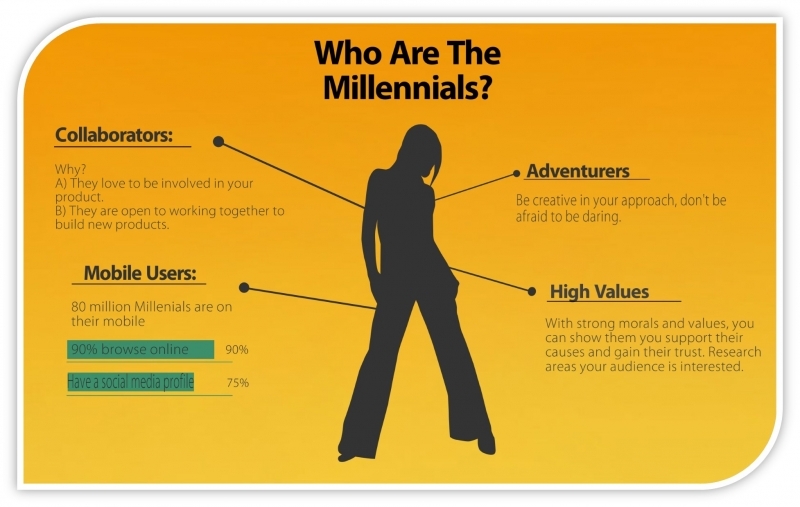 So what can you learn from millennials? Collaborators: Millennials love to collaborate and often blur the lines between customer and producer. They are a generation that has grown up with a ‘we are in this together’ perspective and are very interested in working and interacting with sites. Online publications have an excellent opportunity to actually engage with their audience and ask them to contribute to new products or projects. This is a long term strategy but is very rewarding; you should get to know them as they are going to be your audience over the next few decades. Adventurers: If you are a millennial you will understand what I mean by this. You want your sites to be developing new ways of presenting content, or giving you new experiences that will bring out different emotions, joy, anger, curiosity. This gives online publications a green light to be creative in the way you provide your content and display ads. Be daring, your audience are expecting it. Values: Being from the millennial generation myself I can definitely relate with this one. Millennials can really connect with a site/brand that has support the causes they are interested in. Think about your target audience and find a niche area they care about and provide support to that area. You will find that your audience base will grow and more people will be willing to pay for your services/products. Don’t forget that every one of your audience is an individual, even the older generations are being influenced by the social culture of today and are also evolving to new media. Try and be inclusive in your upgrade efforts so that you don’t leave important groups out. I cannot stress this enough, but if your site is not device friendly, then you really need to step up and get to work. When I say device, I am referring to the multiple platforms that people are now using to access information, whether it’s a 7” inch smartphone, or a wearable Apple Watch, you have to make sure your site is working across all of them. OK, it might be a bit of work in the beginning, but the lasting effects will be worth it (start by checking if your site is mobile friendly with Google’s awesome tool). The amount of people using both mobile and tablet platforms for internet searches has skyrocketed in the last 4 years, and the varying devices that are now on the market is making it harder to be optimized for everything. comScore found that in the US, the number of people using primarily mobiles for all of their internet searches as topped desktop users, which is a sign of things to come. 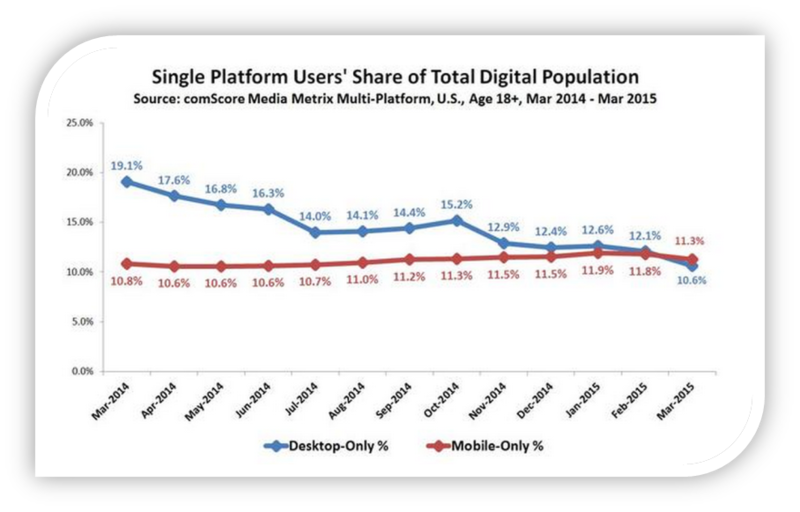 Your readers are going to be coming from all different mobile devices. It is up to you to use your analytics to check where you traffic is coming from and build your strategy from there. Don’t focus too heavily on one device as you will need to be flexible in order to keep up with future technologies. Why not consider an adaptive web design, though this is a little extra work, it will allow your site to fit multiple devices automatically. If this is an area you want a more in-depth look read, check out the latest mobile advertising trends in our recent blog post. When you talk about monetization, whether if it’s a news outlet or niche blog, there is always the subject of advertisements. In the last year it seems that banner ads are on their way out, whilst visual advertising is becoming more popular. One way to upgrade your site and increase income is to take on new methods of advertising that is based on visuals. Both in-image and video advertising are huge industries that are set to go big by the end of the year, so it’s wise to start early. If you didn’t know, imonomy is one of the in-image industry leaders and we help online publishers monetize their image real estate. If you are interested in learning more about this new revenue building strategy you can apply here. There are many practices you can put in place to upgrade your site and these are likely to increase your revenue. However, in my opinion if you are not producing quality content that is meaningful to your readers, it will be very hard to make more money, even from the most upgraded site in the world. In the past it was enough to use a keyword driven technique to get your site to the top of the search engine. These days Google has made it much more difficult for people to stuff their content with keywords just as a way to get to the top. Now you must invest in understanding your audience and providing content that is going to engage them in a modern way. Instead of just creating great content, you have to add an extra oomph that will get you to the top of search engine lists. If you read our blog before, you will know we love the Moz team and especially Whiteboard Fridays with Rand Fishkin. This excellent session he explains why the way people write needs to be changed and how to push up the bar of excellent content production. I think that the future for online publications relies on trust. People are more likely to trust and buy from you when you are relatable. Your website is just the face of your brand, and by investing time and energy into developing real services (offer consultations, personal interactions with readers) you can really increase the public’s trust in you and your products. This might sound aggressive, but this tactic is actually being implemented by sites like the U.K.’s ITV and Channel4. This method stops people with ad block from viewing any your content and only allows access once ad block is removed. Adblocking is a growing threat to online publishers and I think that the more publishers that make this kind of stance against it will help the online publishing industry get back on its feet and keep providing quality content to its audiences.